Elegant and subtle is how I would describe the designs made with this kit, which included the wider S-Lon in navy, faceted quartx rounds , sized 6mm and 10mm as well as a lovely strand of graduated Iolite small rounds. Other materials can be substituted if desired. Just make sure that the 10mm rounds will accommodate 2 strands of thick S-Lon. The show can be seen by clicking here. This design was demonstrated on the show. 1. Cut 50cm cord and fold it in half. Pass a fine thread or piece of wire through the fold and use it to thread 5 x 10mm beads onto the thick cord. Leave a loop at the fold in the cord and tie a temporary knot at the other end of the cord to keep the beads from falling off. 2. Cut 80cm x 4 of cord and thread it through the loop made in step 1. Centre the cords and position them on the disk on either side of the dots. Use Round Braid to create the side of the necklace. Decrease the size of the loop by pushing the beads close to the braid. 3. Repeat for the other side of the necklace. Tie the 2 sides together in a double knot and seal with a drop of glue. 4. Make the tassel by threading a selection of beads onto the cords and keep them in place with a knot. 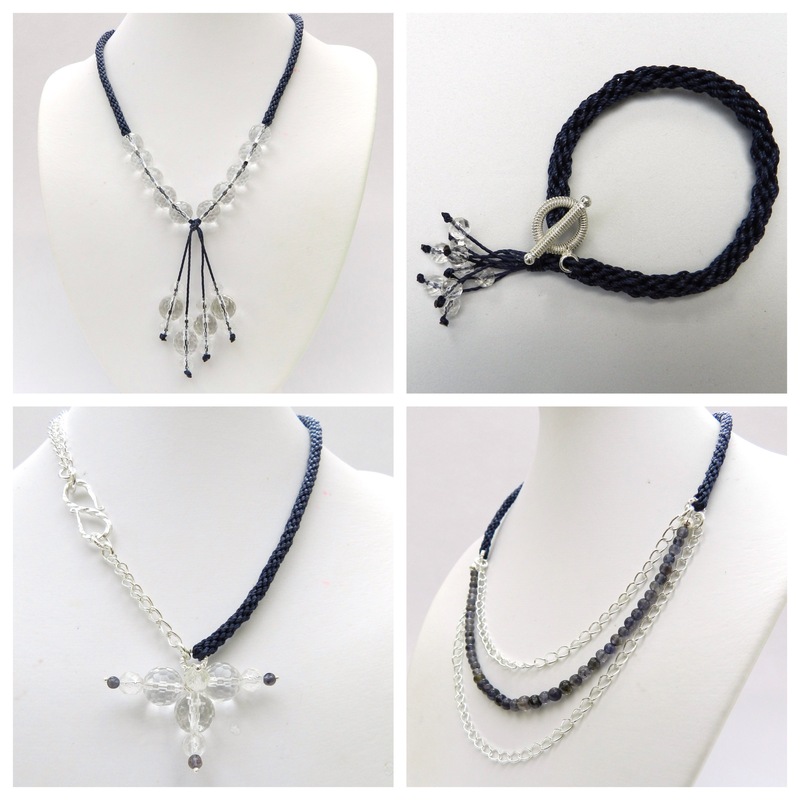 This necklace is made by making a focal of beads threaded onto wire and twisted together. Use the thickest wire you can get through the holes in the beads. Use the 3 ends of the wire to make a wrapped loop large enough to take 4 cords and a jump ring. Start the braid by passing 4 x 1m cord through the wrapped loop and positioning the 8 cords on the disk. Use double chain on the other side of the necklace. Follow these instructions to make the bracelet. This type of necklace is made by attaching graduated lengths of chain and gemstones threaded onto beading wire to a decorative jump ring. Use this jump ring as the starting point for the braid on either side. Thread 4 x 60cm cord through the ring and position the 8 cords on the disk on either side of the dots.